Fourth American heroic in train attack: Mark Moogalian attempted to disarm gunman, was shot. 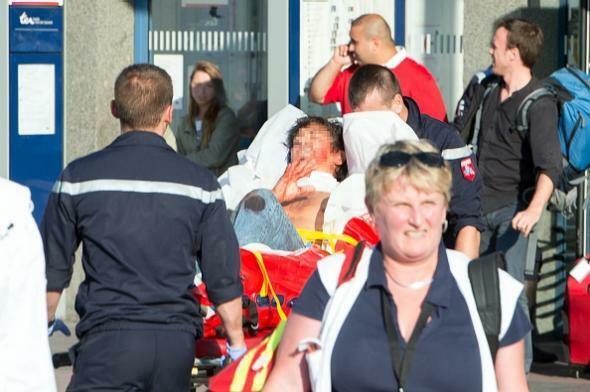 Mark Moogalian is taken for medical treatment after the train attack last Friday in northern France. Before the other men got involved, Moogalian tried to take away the suspect’s rifle but the man shot Moogalian in the neck with a Luger pistol, his wife, Isabelle Risacher, told France’s Europe 1 radio … Risacher told France’s Europe 1 radio her husband was quickly suspicious of the suspect because he entered the toilet with his suitcase and stayed inside a long time. Moogalian remains hospitalized in the city of Lille for treatment of his neck wound—which was also treated by U.S. Airman Spencer Stone, who himself was injured, aboard the train—and broken ribs. Moogalian will receive a French Legion of Honor medal once he recovers. A sixth individual, a Frenchman who has chosen to remain anonymous, reportedly helped alert other passengers to danger after encountering el-Khazzani outside the bathroom. Moogalian, a native of Virginia, is said to have lived in France for more than 20 years. He runs a language school that teaches English and French and documents a number of artistic and musical pursuits on his personal website.